Decorating for the holidays is fun. The rush of nostalgia and memories attached to each individual ornament, wreath, garland and advent calendar makes putting everything up a real joy. Taking it all down is another matter. The problem with Christmas decorations is that accumulating them seems to be a lifelong project, which means every year there is more stuff and therefore less space than the previous winter. If you’re having trouble deciding what to do with all those Santas and strings of lights at the end of the yuletide season, here are five clever storage ideas that can help you. Archival boxes for your antiques. 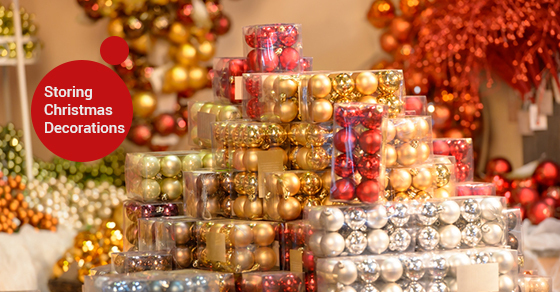 Many people have Christmas decorations that are family heirlooms and have been passed down, sometimes through several generations. These should be stored separately and given some extra TLC so they can continue to be passed down. The dividers in archival storage boxes are acid free, compartmentalized and offer fade protection from ultraviolet light. Christmas light keeper bags. Christmas lights are maybe one of the few exceptions to the nostalgia rule. The tangled mass of lights and cords are very rarely fun to put up, if only because of the frustratingly long time it can take to untangle everything. Light-keeper bags allow you to store up to 200 feet of light strands conveniently and efficiently so that you are not unpacking an enormous bird’s nest of cords every December. Artificial Tree Storage Bags. If you have an artificial tree, chances are it came in an enormous, unwieldy cardboard box you are still using. Ditch the box and swap it out for a soft-sided carrier bag. The bag comes with handles on either side, making it a cinch to carry up from the basement or haul down from the attic. Invest in some easy to hang elevated storage. Elevated storage units can be suspended from the roof or rafters of your garage and attic and free up valuable floor space, not to mention, eliminate the need for tripping and bumping up against boxes and other standing decorations as you are trying to remove and put everything back, or accessing the space for other reasons throughout the year. Utilize clear boxes. Clear, square-hinged boxes are great ways to store the loose odds and ends of your holiday decorating arsenal (i.e. hangers, ribbons, small mantelpiece items). The boxes are quite durable and best of all, transparent, meaning there is no guesswork involved when trying to locate harder to find items. They come in a wide range of sizes and are a great use of vertical space. Christmas decorating doesn’t have to be a monumental chore and decoration storage doesn’t have to be the trainwreck that it ends up being for some. Maximize vertical space, use containers that make things easy to find and carry and protect the things you would like your children to someday use to decorate their own homes. Follow these tips and decorating (as well as un-decorating) will be a breeze.